Located on the south side of the River Tees, in north-east England, the Roman villa at Ingleby Barwick is one of the most northerly in the Roman Empire. Discovered originally through aerial photography and an extensive programme of evaluation, the site was excavated in 2003-04 in advance of housing development. Unusually for the region, the site demonstrated evidence for occupation from the later prehistoric period through to the Anglo-Saxon. The excavations at Ingleby Barwick are significant not only for their scale but also for being carried out under modern recording conditions, allowing for extensive and detailed analysis of the finds. 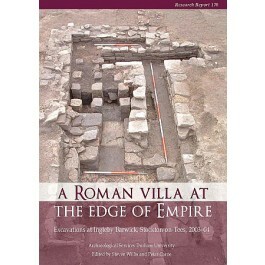 The villa is also a rare example of a Roman civilian site in the hinterland of Hadrian’s Wall. The Roman winged corridor villa and its outlying stone structures were surrounded by an extensive layout of rectilinear enclosures. While the main villa building was preserved in situ, excavation of the surrounding area revealed features such as ovens and paved surfaces, as well as rare finds such as a glass tableware vessel probably from Egypt and a large hoard of metalwork. The pottery has allowed a detailed phasing of the site to be proposed, while the environmental evidence reveals the villa to have been a working farm.